Most mappers would recommend fitting a pump prior to mapping as upping the boost requires more fuel and can put strain on a old pump . You can fit a decat and drive off boost but you should remap asap ,as the boost controll system and oe settings will struggle to keep the boost levels in check . Due to the less restrictive catless downpipe and this could cause the boost to come in earlier or hit higher peak values ,which the oe fueling map can't compensate for (running lean/ fuel cut due to overboost). Think the ppp wrx is supposed to run 265hp standard and use the tdo4 ? If so you probably won't see a great hike in hp ,as the tdo4 generally maxes out at 290 hp ish but you should see better drivability (boost coming in sooner ) and economy off boost . Double check that you've got a tdo4 first , by either googling it or looking on the coldside (silver part of the turbo) as I'm not 100% up to scratch on my blob onwards spec . Not sure if the ppp has a precat in the up pipe ? But if so either a aftermarket up pipe or sti up pipe would be worth fitting while doing the turbo ,as it will help spool . Most front entry subaru fitment single scroll turbos are a straight swap but the usual route is either a tdo5 (cheapest ) or vf35/vf34 or vf43 .just beware of cheap copies and try to get the water lines , oil lines and banjo bolts with the turbo . Your standard injectors should be good for 320 hp ish but sti "pinks" would match the hp of the turbos above @ about 330 to 350 hp ish . 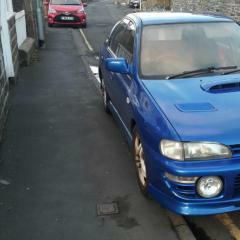 Second hand subaru fitment tdo5 16g (Mitsubishi made) cost between £150 to £200 . Vf 35/34 /43 expect to pay around £350. Sti pink injectors are about £100 2nd hand . Try a reputable breaker ,like matt baker at mbdevelopements on f.b if you want to keep the cost down and buy second hand . The only new "cheap" sub £800 turbo manufacturers that some people have used is kinugwa and mamba but depending on who you talk to , some say they're rubbish too . I only have personal experience with a tdo4 (made 265hp). Vf35/34 and pink injectors is the usual route ,as thats what's fitted to bug and blob sti's. Once you've fitted a bigger turbo and been remapped you might end up having to renew the clutch ,if its the original and worn it might start to slip shortly afterwards .Also might find you need to upgrade the brakes to reign in the extra ponies from a bigger turbo . So really it depends on budget and what you want from the car . As a remapped tdo4 could get you a quick spooling 290hp (ie faster in 1st to 3rd) , which might suit your needs more than 330hp thats not as responsive. Think my tdo4 was a tdo4 L but that was on a 97 uk turbo . ok i'll have a look around for second hand turbo and injectors, thanks for the help again. No problem bud, just try not to get too hung up on pub figures. Could be numerous things , no ecu codes ? Are the spark plugs due soon , colour and condition can help pin point a cylinder misfiring or general running issues . If they are due a change ,most switch to heat 7's when modified . Do you have a boost gauge ? A boost leak could cause a lack in power. Boost solinoid clean and ecu reset might be worth a go ,as well as checking if the plugs are all the same colour and the right colour . I don't actually know technically whats the "g" stands for but its a way of measuring the turbo compressor (coldside) wheel, 16g is stock size and 18g is slightly bigger. A tdo5 16g (stock subaru) will spool earlier but flow slightly less air at say 1 bar .